Hi, I’m Jessica. I head up marketing here at Evoz and I’m also a brand new mom. My little guy was born just a few short months ago and has quickly become the love of our lives. I was warned that after my baby was born, we’d be entering what is often called “The Fourth Trimester”. I’m sure all of you moms know what I’m talking about, but in case this is a term with which you are unfamiliar let me explain. The fourth trimester is the first three months after your baby is born, a time when both of you are trying to adjust to your new worlds. For new parents it’s about healing your body (moms specifically), figuring out how to survive on very little sleep, and learning to live with your newest family member. For babies it includes the many transitions from life inside to life outside the womb — how to eat, cry, sleep, see, move (some weighty stuff!). In my limited experience as a parent, I like to called this phase SURVIVAL. While I was still pregnant, a good friend told me that during those first few weeks at home with her newborn she felt very primal. Nurse, sleep, eat, hydrate, repeat. I felt the same way. And the whole “sleep when the baby sleeps” advice — not for me. I am not a napper. I can’t sleep anywhere except in my bed at night (unlike my husband, who can fall asleep at the drop of a hat, anywhere and anytime). And I have a hard enough time sleeping when conditions are perfect, let alone with a brand new baby. I knew we weren’t going to sleep. However I don’t think I fully understood how little sleep we would truly be living on during that first month. The other major thing I didn’t anticipate is how much I would miss my alone time. I really missed those first few minutes of the day when I’d roll around in bed before getting up, perusing the internet for videos of cats or taking BuzzFeed quizzes. I also missed being able to take a bath before bed without needing to jump out in the middle of it in order to feed or soothe my brand new babe! So I was seeking 2 things during that first month — sleep and a hot second to myself. Sleep was an adjustment for my new little guy. Most infants long to be close to their mothers and sleep best snuggled and warm in their arms. But new babies sleep for 16-17 hours a day, so cuddling them in your arms for the entire time isn’t feasible – unless you literally have no other life. So in come the baby sleep devices, and of course we have them all. I feel like the only major and most popular sleep devices missing are the DockATot and the MamaRoo. All of these things are supposed serve as places for my baby to safely hang out while I get a bit of “me time” (that is, eat a snack, take a shower, change out of my pajamas, or maybe get that quiet bath I so long for) OR get some sleep of my own. We tried them all. 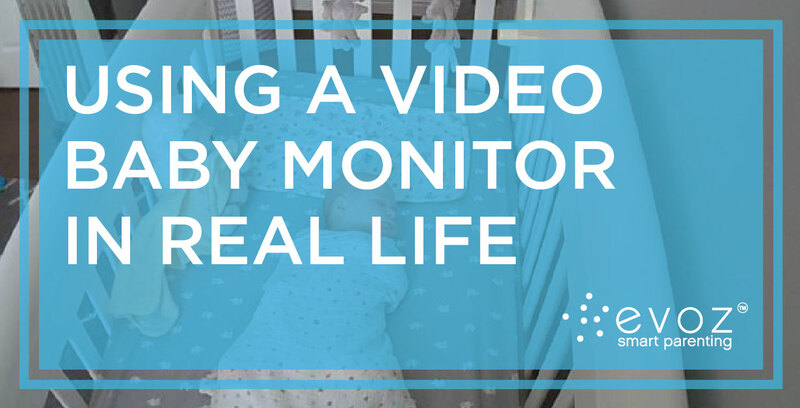 Being able to move our Evoz baby monitor all over the house was heaven. All we had to do is unplug it, move it to the location of the sleeping-device-du-jour, and plug it back in. 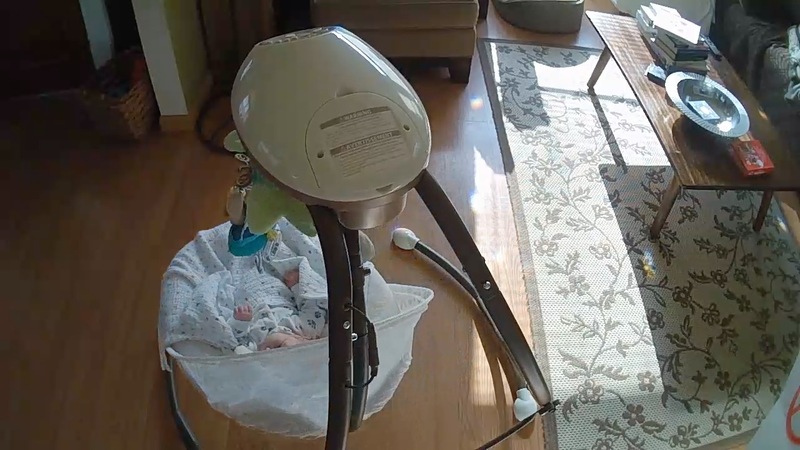 I could head to the kitchen to make myself some lunch, leave my baby boy to snooze in a nice quiet place and regularly check in on him from my phone. In case you’re curious, I’m currently using Evoz as an iOS baby monitor on my Apple iPhone 7; the Evoz app is of course compatible with iOS and Android devices. One of the other things I really appreciated during this first month was that I didn’t have to haul around a separate monitor. I felt like I was already moving a million things from place to place: my water bottle (necessary to stay hydrated for nursing! ), a burp cloth, a binkie, my phone…not to mention the baby! I need more hands! His crib. Which ultimately was my favorite location for him to nap, because I felt like it was good practice for the day he eventually moves from sleeping in our bedroom to sleeping in his own room. So there you have it. Month one — we survived, he survived. 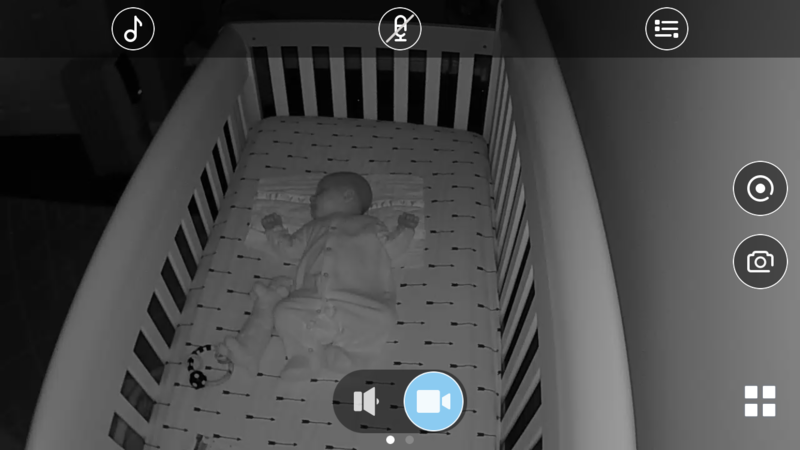 And we maybe feel like we’re getting the hang of things over here with the help of our Evoz baby monitor keeping an eye on our little guy. I am happy to say that I have taken several relaxing baths and wasted plenty of my alone time on BuzzFeed quizzes.